Get ready, convention fans, HawaiiCon is here, and it has all the attractions the biggest conventions have on offer, such as a long roster of celebrities, panels, workshops, special events, cosplay contests, plus a few more elements that set's it apart from most small cons. It is going to take place on one of the most beautiful beaches in the country, where you can wake up with a swim or snorkel and bump into your fave celebrities doing the same. 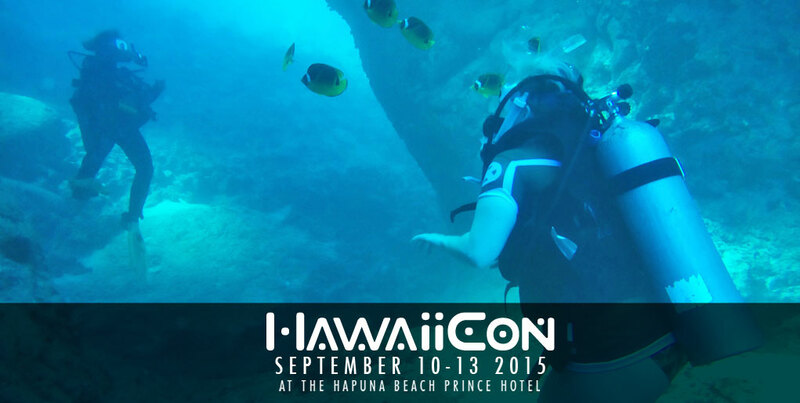 For the fans, the most unique experience Hawaiicon has on offer is for you to join your favorite celebrities on these exotic landscapes for these three to five hour long tours: ziplining, night scuba diving with giant manta rays, and hiking in a cloud forest. For example, Thursday’s programming begins with a zipline tour with Dichen Lachman (Dollhouse, Agents of SHEILD, The 100) and Aaron Douglas (Battlestar Galactica, The Returned) provided by Kapohokine at 7am. Then the vendor’s areas opens at noon, but most of the panels start at 3pm and run until 10pm. After her experience in 2014, actress and stuntwoman, Patricia Tallman (Babylon 5, Night of the Living Dead, Jurassic Park), has joined the staff at HawaiiCon this year. “This is arguably the best convention on the planet and by far the best fan experience”, she said. And as an avid scuba diver and hiker, Pat, as she likes to be called, will be in charge of all the tour activities. The schedule of tours can be found by clicking here. Friday begins three full days of panels and events that run from 7am each morning until 10pm each night. The most popular day last year was Saturday night’s cosplay contest when hundreds of people showed up to root for their favorite cosplayers from around the world. This year’s celebrity judges include Monika Lee, Riki Lecotey, and BelleChere, arguably among the top 20 most famous cosplayers in the world. HawaiiCon is a non-profit organization whose mission is to increase public awareness of science, the science fiction genre, and mythologies, past and present, which guide humanity. HawaiiCon will emphasize education and uniquely Hawaiian contributions to science. For more information go to www.hawaiicon.com or follow them on Facebook or on Twitter.